During the Spring Festival this year, I had the opportunity to visit one of the most iconic tourist destinations in China. Zhangjiajie, made even more famous by the movie Avatar, the highest-grossing movie of all time. It’s in my China Bucket List. I have this desire to visit beautiful places which were featured in movies, especially famous movies. Examples are Maya Bay, Thailand from the movie The Beach, and the set of The Lord of the Rings in New Zealand. So, when I saw an article on the internet in 2013 stating that the Hallelujah Mountains in the movie was shot from a real location somewhere in China, I dreamed of visiting this amazing place. It is located in Hunan province in central China. This is also the province of People’s Republic of China founder, Mao Zedong. Having able to experience real “Hallelujah Mountains” is so fulfilling; the grandeur of the palce is overwhelming. Photographs cannot give it justice. It’s really different when you’re witnessing it with your eyes. Apart from the fact that our eyes can capture more details, depth, contrast compared to even the best lenses out there, the scale of the place can’t be captured by cameras. So, if you have the opportunity, I highly recommend visiting Zhangjiajie. I made an itinerary to help you guide in your journey. This is a 5-day itinerary. I suggest allotting 5 days for this trip. The national park is so huge and it’s nice to slow down, savoring each moment in this majestic place. They are 34 km. apart (45 minutes by bus.) Zhangjiaiie City is where the airport, train station, and Tianmen Mountain are located. Zhangjiajie National Forest Park, 45 minutes away from Zhangjajie City, is where the main attractions are. A huge national park where the Avatar Hallelujah Mountain is located. It’s so huge that so have to take buses inside the park in going from one attraction to the other. I flew from Beijing to Zhangjiajie. You can also take trains from major cities in China. There is a district called Wulingyuan just outside the national park. This is where you will stay most of your time. -Start your day early. 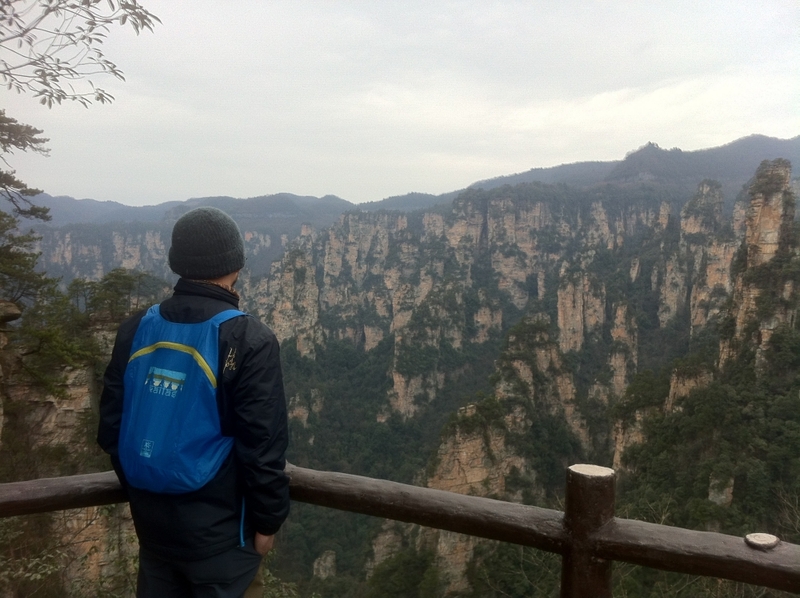 Take a bus from the city to Zhangjiajie National Forest Park. “Senlin Gonyuan” in Chinese. Travel time is 30-45 minutes. Fare is 12 rmb. -Buy a ticket from the ticket booth near the entrance-139 rmb during low-season and 248 rmb during high-season. The ticket is good for 4 days. Don’t lose your ticket. You must present it every time you enter the park. 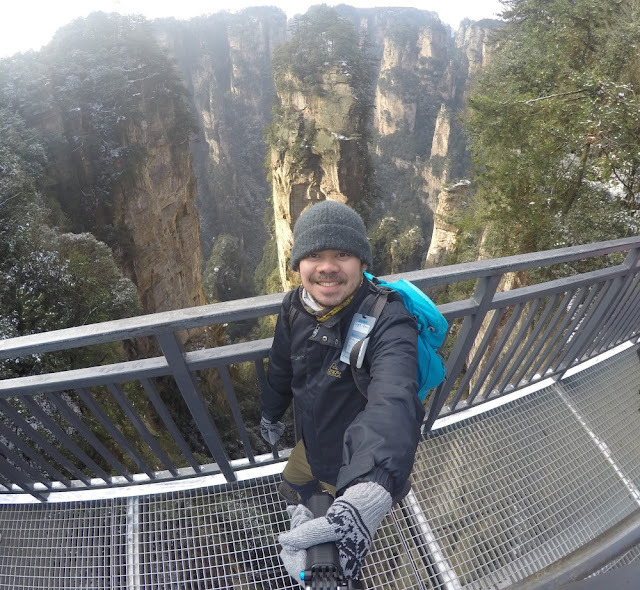 -From the entrance of Zhangjiajie National Forest Park, walk a few meters and turn right. Hike through the forest until the Bus Park. The hike is approximately 2-3 hours. You will hike along a stream. -There’s a mini museum right before the Bus Park. Take time to visit it to have a better understanding of the majestic area. -Take a bus going to Wulingyuan District. -Check-in at Zhangjiajie April Hostel. The hostel is located in Wulingyuan District. Optional: In the afternoon, visit Baofeng Lake-a beautiful jade-colored lake. Admission fee is 97 rmb. -Start your day early. Enter the National Park from Wulingyuan side. From the Bus Park at the entrance, take a bus going to Tianzi Mountain. -Hike all the way to the top of Tianzi Mountain. There are numerous view points along the way. Take your time. Eat lunch along the way or on top. -Go down using cable car. 76 rmb one-way. -go to the Bus Park, then take a bus to Wulingyuan. -Rest at your hostel, have Chinese tea or authentic Hunan noodles. -Start your day early. Go to Wulingyuan Bus Station. The bus station is in Wulingyuan District, not inside the park. Take a bus going to Zhangjiajie National Forest Park (Senlin Gongyuan). The fare is 10 rmb. -Then enter the park from the main entrance. Take the bus going to the cable car station that will take you up Huashi Village. (Huashi Village is actually a mountain, not a village.) Make sure to go all around on top of the mountain. The views are majestic. Cable car price: 46 rmb round trip. Optional: You can climb up the mountain if you want (or if you don’t have money). -After exploring Avatar Hallelujah Mountain, take a bus going to Yuanjiajie area. Explore the place, enjoy the scenery then take a cable car going down. 46 rmb one-way. -Hike through the Oxygen Bar area going to the Bus Park. Enjoy the high concentration of negative ions and abundant oxygen in that area. It’s good for your health. -From the Bus Park, take a bus going to the Bus Park at the Down Cable Car area of Huashi Village. -Then, hike going to the entrance of Zhangjiajie National Forest Park. You can send postcards at a Tourism Area just outside of the park-for free. -Go to the Bus Park and take the bus going to Zhangjiajie City/Dayong. Just ask the locals where the bus is, going to Dayong. Fare is 10 rmb. -Start your day early. From Qixi Hostel, take a motorcycle taxi going to Cable Car Station going up Tianmen Mountain. Motorcycle fare is 10 rmb. -Take a cable car going up Tianmen Mountain. It is one of the longest cable cars in the world. -After exploring Tianmen Mountain, you can also visit Tusi Castle and learn more about the Tujia people, the natives of Zhangjiajie. Admission fee is quite steep though, 97 rmb, ouch! Optional: If you still have time, visit Salamander Museum and Research Center. It is located near Tusi Castle. Just show your map to a motorcycle taxi driver. It’s a good place to see and learn about the Chinese giant salamander and the people of Hunan’s obsession with it. What are you waiting for? Pack your bags and visit this awesome place. It’s worth it. Spoiler Alert: The mountains are not floating. I recommend Qixi Hostel in Zhangjiajie City and April Zhangjiajie Hostel in Wulingyuan District for your accomodation. Thank you, Shal. At first I thought it was difficult, too. But actually when you're there, it's pretty easy and straightforward.